Elbow are launching a second brand of beer. The 'Mirrorball' band's debut ale 'Build a Rocket Boys! ', named after their 2011 album, proved a hit with fans and beer-lovers and now they've brewed a new beverage called 'Charge', named after a track on their upcoming sixth album, 'The Take Off And Landing Of Everything'. 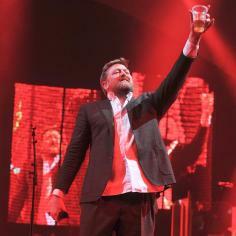 Frontman Guy Garvey said: ''With the help of the good people at Marston's [Brewery] we've created a beer with a spicy American feel that still retains the class of a traditional British real ale. 'Charge' is described as a ''refreshing golden pale ale, with a session-friendly ABV of 4.2 per cent''. It will be available in Nicholson's pubs across Britain from February 4 and through Marston's venues in March. Elbow - which also features Mark Potter, Craig Potter, Richard Jupp and Pete Turner - are planning a series of exclusive pub gigs for fans to listen to the new album and taste the beer in coming months. The band worked with Robinsons Brewery on their 'Build a Rocket Boys!' beer, which sold nearly 750,000 pints in two years, from 2011 to 2013. Elbow's new album will be released on March 10 and tracks also include 'This Blue World', 'Fly Boy Blue/Lunette' and 'New York Morning'.